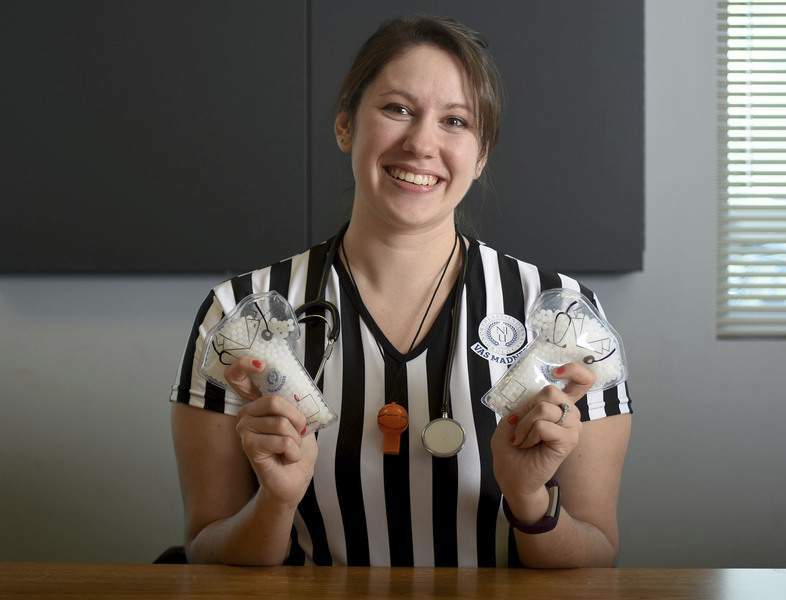 Rachel Von | The Journal Gazette Chelsea Combs holds up a couple of ice packs that are being given away with Northeast Indiana Urology’s Vas Madness vasectomy promotion. When I was a kid, the symbol for March was always a kite. That’s because it’s supposed to get windy in March, making it a good time to fly a kite, way better than, say, August. People don’t seem to fly kites anymore, though. They have drones. So what’s the new symbol for March? Well, there’s the NCAA basketball tournament. That stands for vasectomy madness. Apparently, March, specifically the start of the NCAA basketball tournament, is a hot time for men to get vasectomies. Barney Niezer, practice manager at Northeast Indiana Urology, said he has no empirical evidence that more men get vasectomies in March than any other time. "But it’s my understanding that men choose to get vasectomies prior to the first round" of the basketball tournament. In fact, NEI Urology is having its own Vas Madness promotion, which runs Wednesday, Thursday and Friday. Men who schedule the procedure during that time don’t get a discount on the $999 price, but they do get a cooler with various freebies and extras. Then, presumably, they go home, lie down on the sofa and watch college basketball games for the next three days or so, and no one can complain because they’ve got an excuse. It doesn’t take long to recover from a vasectomy, though men are advised not to do any lifting for a few days, Niezer said. Most vasectomies, by the way, are scheduled by women. They are the ones who seem more interested in their husbands or partners having the vasectomy. The operation does have its advantages. It’s more reliable than condoms and doesn’t have possible side effects like birth control pills might. Northeast Indiana Urology is far from the only place having a promotion. "All I know is that there are more than a handful of urology groups that have similar promotions," Niezer said. "It’s a worthwhile effort to get some business." How this tradition, if you want to call it that, got its start is hard to say. But it has been going on for a while, and it is good for business, at least this time of year. Generally, Niezer said, business is a little slower in the first quarter of the year. One explanation is because it is still early in the year and patients have new deductibles to pay. Also, older patients might have headed south for the winter, so they aren’t visiting local urologists. So drumming up a little bit of vasectomy business makes sense. Besides getting the cooler full of little extras, Niezer said, each patient will get to draw the name of a team in the NCAA tournament. The person who draws the team that eventually wins the tournament wins a large-screen TV. Unfortunately, the winner won’t be able to watch the tournament on that large-screen set. The tournament will be over by the time a winner is known, but there’s still the Masters golf tournament April 6-9. And there are still slots open for vasectomies, Niezer said, but Thursday and Friday fill up fast, Wednesday not so much. Frank Gray reflects on his and others’ experiences in columns published Sunday, Tuesday and Thursday. He can be reached by phone at 461-8376, fax at 461-8893, or email at fgray@jg.net. You can also follow him on Twitter @FrankGrayJG.